Good pasta dishesI had the Cannelloni Frutti De Mare at the server's recommendation and it was...It was really great pasta and had a good amount of sauce.Pasta to perfection! "Thanks for your consistent quality and service." 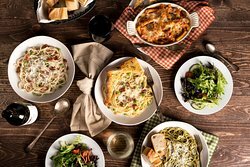 See reviews that mention Pasta to perfection! 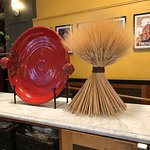 "When visiting Oregon Pastini is a must for our Italian food fix." "All the food was delicious and the desserts were to die for." 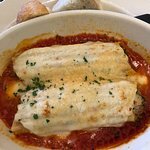 See reviews that mention Great Italian food! 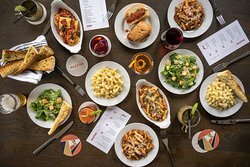 Inspired by the farms, vineyards and waters of the Pacific Northwest, we at Pastini are dedicated to serving up two of life’s greatest pleasures… pasta and wine. 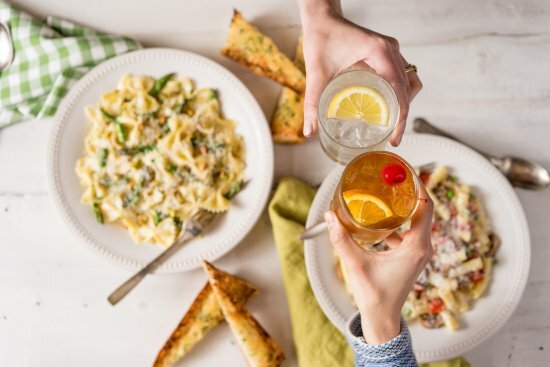 We love how a steaming bowl of pasta warms your hands as well as your spirits. We love the sound a cork makes when it nudges away from the bottle. 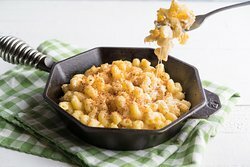 Using responsibly sourced ingredients, we craft craveable dishes with a local sensibility that is true to our roots. Our thoughtfully curated wine list celebrates both stellar Northwest wineries, and small family-owned vineyards in Italy. 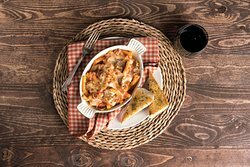 With every meal, we aim to bring our guests together to share made-from-scratch meals that are seasoned with laughter and great wine. Great menu and friendly staff & servers. 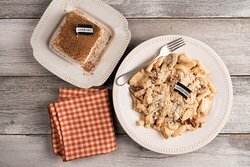 Enjoyed GF pasta options and a YUMMY GF tiramisu. Visited twice during my stay! Good little Italian place ! We went with another couple and had a good dinner. The entree is entirely alone-no salad, veggies, bread or anything extra. That was a bit disappointing. The main dishes were all good though. 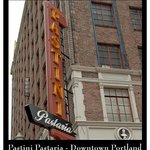 When visiting Oregon Pastini is a must for our Italian food fix. great food, prompt service. Grandkids love it also. 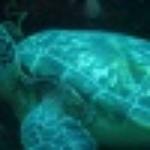 Get quick answers from Pastini staff and past visitors. Could you accommodate a party of 15 at 6 p.m. on Sat. Feb. 13? I would definitely NOT reserve a large party at Pastini's. Their restaurant is loud and the ambiance not that great at that location (nor most of the other Pastini's locations). The service we encountered there was also not that friendly. Seems they want to get you in and get you out. If you're looking for really good Italian food in the downtown area...the absolute best one, hands down,is Serratto's on NW 21st Avenue and Kearney. They can easily accommodate large parties and the ambiance is amazing! 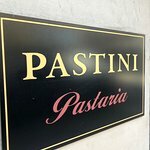 The food is far superior to Pastini's and the service has almost always been good (one time on NYE it wasn't up to par but on our next visit it was great). The prices are very comparable but the big difference is the quality of the dishes offered. Everything is delicious. If you're there at Happy Hour the Painted Hills Burger is the best in Portland! And their pizza del giorno is incredibly good as well. Their spaghetti pork & lamb bolognese is also a HH must have. 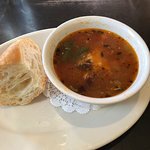 And if you're just wanting soup and salad you have to try their French onion soup. Oh my gosh it's so good. 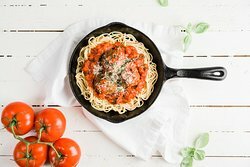 Incredible HH food all priced between $8-$11. For dinner on the regular menu we always get the lamb osso buco. But their ravioli and rigatoni are very tasty as well. And if, by chance, someone in your party wants something besides Italian, there are a lot of other choices, too. Their Draper Valley roast chicken is one of the best in Portland! And the scallops or salmon are also very tasty. 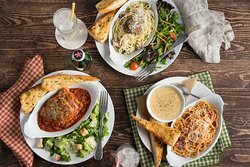 Each entree is between $14 to $30 on average but with the far superior dishes and 10x better ambiance then Pastini's this is the place for your large group! Serratto's even has 2 private rooms in the upstairs area with french doors to separate your large party from the rest of the diners (if you're looking for a more intimate setting). 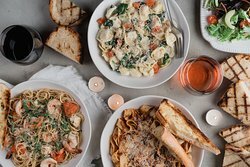 In my opinion being a Portland local and having dined at about every place in downtown and the local area I'd never try and book a large party at Pastini's. My advice is go to Serratto's! If you're trying to make a good impression with your family and friends they're definitely the restaurant that will achieve that!